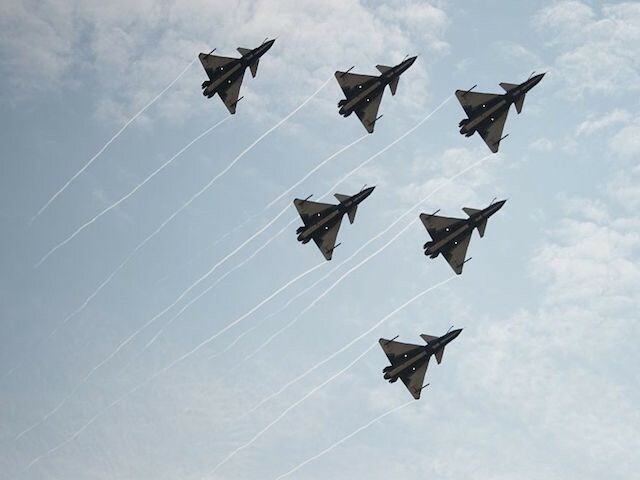 The official told Fox News that one of the armed Chinese J-10 fighters flew beneath the EP-3 reconnaissance plane and then suddenly popped up only 300 feet in front of it. The Pentagon stated that the EP-3 was “on a routine mission operating in accordance with international law,” flying about 80 nautical miles east of the Chinese coast in international airspace. A Navy spokeswoman told the Financial Times it was unclear why the Chinese pilot flew so aggressively. Other U.S. officials described the Chinese maneuvers as “unsafe” and “uncharacteristic” of their typical behavior. As most media accounts of the incident point out, it occurred only a few days after U.S. Chief of Naval Operations Admiral John Richardson held a conference call with Chinese Vice Admiral Shen Jinlong to discuss cooperation on North Korea. “The close-in surveillance of the US military around China’s coastal strategic areas has been a major problem between China and the US. The US defends such robber acts under the guise of ‘freedom of navigation and overflight.’ The Chinese military has exercised restraint when undertaking intercepts. The public actually wanted the US reconnaissance plane to be shot down directly,” claimed the Global Times. The editorial went on to advise the Chinese Navy to “carry out operations close to the US and its allies, which can become a bargaining chip to urge the US to stop its activities in China’s coastal areas.” One of the Global Times’ bright ideas for hassling the United States is to send China’s aircraft carrier Liaoning to conduct training exercises close to American naval bases. “The U.S. doesn’t respect restraints and rationality, but strength and strong will. Therefore, perhaps it is time for China to change the way it responds, and starts making some troubles for the U.S.,” the editors declared. Meanwhile, the Xinhua news service carried admonitions from Chinese officials for the United States to stop its “unsafe, unprofessional, unfriendly” actions. “The close-in reconnaissance of the U.S. aircraft threatened China’s national security, damaged the military safety between two countries and put the pilots of both countries in danger. This is a source of danger for China-U.S. military safety,” Ministry of National Defense spokesperson Ren Guoqiang told Xinhua.